Why do I have to measure the right way? Whats the worst that can happen? I know it seems like every chef on TV just throws the food in a bowl, chops this and that without measuring anything, and then everything magically seems to turn out. True, but as a new cook it is important to understand the basics and follow directions. After following a couple of recipes word for word, you will naturally know what a tablespoon is, and what a cup of this or that looks like. This is like when Mr. Miyagi told Daniel-san to sand the floor, paint the house, and to "wax on wax off." Measuring is the foundation of following a recipe and making a recipe you would never be able to prepare on your own. Remember to measure liquids like water, milk and juice in a liquid or wet measuring cup. This cup will have a spout to pour the liquid out, and will have lines marked on the side to measure fluid ounces. When you measure liquids make sure that you place the measuring cup on a flat surface to level the liquid and get an accurate measurement. 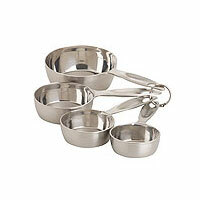 Dry measuring cups usually come in sets, the tops are level and they do not have the spouts. 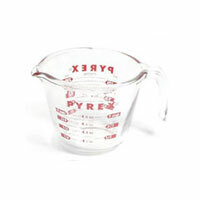 Dry measuring cups measure the volume of dry ingredients. Remember to level off the top of the cup to get an eggsact amount. This is really important when you are baking. Add a little too much oil, maybe too little salt or baking soda and you can really mess up a sweet batch of brownies and I really like brownies! Knowing how to switch up a recipe for 4 in half or into a recipe for 16 is also really important. If you need to find out how many ounces in a quart or teaspoons in an a table spoon, check the conversions below. 1 ounce (oz) = 28 Grams (gm) - But that's the metric system and I don't even want to go there. Temperature: We use Fahrenheit (F) in the U.S. to measure temperature. Most other parts of the world use Celsius (C). To cook like a pro you have got to bring the heat. Baking a chicken at 350 F or 350 C would be the difference between a crisp and juicy bird and a burnt duck. 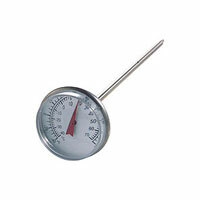 You will also need to use a simple meat thermometer to take the temperature of your cooked food to decide if it's raw, rare, medium or well done. If you need to convert temperatures, try the simple equation below. Water Freezes at 32° F and 0° C, Water Boils at 212° F and 100 C.
When you are just starting out in the kitchen I encourage you to experimenting with recipes from your family, friends, books, magazines and the web. Getting a proper measurement is a great way to try expand your culinary horizons and gain your cooking chops! Comment Moderation is enabled. Your comment will not appear until approved.